This Tour is designed for those who love Chocolate! 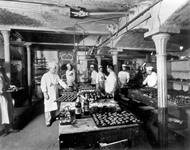 New York City has many Chocolate Factories and Shops for you to enjoy! And this Tour is for you to enjoy the many different types of Chocolates throughout the City while you enjoy the Famous Sites, learn the History and facts about each Neighborhood we explore. Please see ‘LOWER MANHATTAN’ and ‘UPPER MANHATTAN’ TOUR, to see which Tour appeals to you most. This Tour is usually a 4 - 6 Hour Tour, depending on how many stops you desire to make. All our Tours are Specifically Designed for you! No two Tours are alike as all our Guests have different interests. If you wish to have lunch while on Tour, arrangements can be made. Your Tour will begin by your Driver/Tour Guide asking questions such as: “How many times have you visited New York City? What have you seen since you’ve arrived? And, What is it that is most important for you to see and do? What type of chocolate is your favorite?” Then, we point out on a New York City Map the Geographical Layout of Manhattan, the Boroughs, and Neighborhoods. And then we customize a Tour specifically designed for you and your interests. If you have a list of Sites, Stores, Delis, Chocolate Shops, and Neighborhoods you wish to visit, we are here to accommodate your wishes. If at any time you wish to enter a Store, Deli, or get out of your Tour vehicle to take photographs, Shop, Eat Chocolate, or browse a Neighborhood, you are welcome to do so. We highly encourage bringing your camera, as there are so many photogenic buildings and sites throughout the City. Please allow us the privilege of Touring you and your group throughout the great City of New York while you shop and taste some of the most creative and sumptuous Chocolates in the World!